Abandoned septic drain field and pump station revealed by magnetic methods. Cy uses Geolex's proprietary magnetometer array to survey the North Helena hills. Magnetic imagery is commonly used to accurately locate buried pipes, tanks, abandoned wells, waste, UXO, foundations, and other buried structures and voids/cavities, especially when there is a high magnetic contrast between the soil and the buried object. Scott sets up the Trimble R10 base station and repeater for accurate GPS position control. Composite map of 600 acre magnetic survey showing ferrous geology (red bands) relative to background magnetic field shown in blue. Scott conducts a magnetic survey in the rugged terrain of the Limestone Hills, near Townsend, MT to locate UXO. Rob and Cy looking for high iron-content strata in the Limestone Hills near Townsend, MT. Both magnetic and electromagnetic methods are used to detect Un-Exploded Ordinance. Each are suited to particular geologic and cultural situations which must be considered. A survey of the magnetic total field in a given area will reveal a dipole for a magnetic object. This is very useful for UXO detection considering UXO anomalies have predictable dipoles. However, if the soil is magnetic, dipoles can be partially or completely obscured. In magnetic soils an electromagnetic survey of the area is ideal. During an EM survey, an an electric current is used to charge the earth. This creates a temporary magnetic field which can be measured after the current is discontinued. The strength of this decaying magnetic field can be measured to interpret metallic objects from the surrounding soil. More specifically, this method is known as Time Domain Electro-magnetics. The EM-61 used to conduct a time-domain electromagnetic pipeline survey. Magnetic field crew led by Mason Porter (M.S. Geophysics, Montana Tech) conducts a UXO survey in the North Helena Valley. 3D rendering of magnetic data of a 25m x 25m area, the large spike at the right indicates a strong dipole and a likely UXO target. Joe creates seismic waves with a 12-lb sledgehammer, while Mike monitors data. Seismic streamer of 96 geophones to record refracted energy waves from subsurface strata. Seismic surveying has a large number of applications. Simple seismic surveys can yield quick and accurate results that give useful information about composition and structure of the subsurface. Primary wave velocities are used to determine depth to bedrock and density characteristics of the subsurface. Scott monitors the seismic response from the accelerated weight drop during a sapphire exploration project at El Dorado Bar, MT. A seismic survey consists of generating a seismic signal in the ground and then receiving that signal with multiple geophones. Since seismic waves travel through different materials at different speeds, subsurface information can be derived. Small scale refraction surveys are useful for road cuts, excavations, and depth-to-bedrock exploration. Seismic wave velocities also determine rippability, a measure of the difficulty of which soil and rock can be mechanically excavated using conventional heavy equipment versus explosives. Cross-section of subsurface showing primary (compression) velocities. There are various geophysical solutions for investigating groundwater and/or contamination. Magnetics and time-domain electromagnetics are quick and useful for near surface exploration. Resistivity and seismic surveys can provide profiles and 3D data to several hundred meters. Depending on sedimentary overburden, bedrock type, and other cultural effects, either resistivity or seismic may prove most useful. When deep bedrock topography is of interest, gravity surveys can be used to map the sedimentary-bedrock contact. 2D density contrast model from gravity survey showing apparent bedrock ridges south of Rocker, MT. Cy and Mike setup the Ohm Mapper for a resistivity survey of groundwater salinity. Downhole geophysics (gamma, neutron, caliper, etc.) can be used to determine physical properties of rocks and groundwater contamination. Joe and Mike conduct an apparent resistivity survey with the Ohm Mapper to determine soil conductivity. Map of conductive saline water shown in red from pipeline leak in northeastern Montana surveyed with the EM-31. 400 MHz GPR scan of parking lot to detect subsurface voids or cavities. 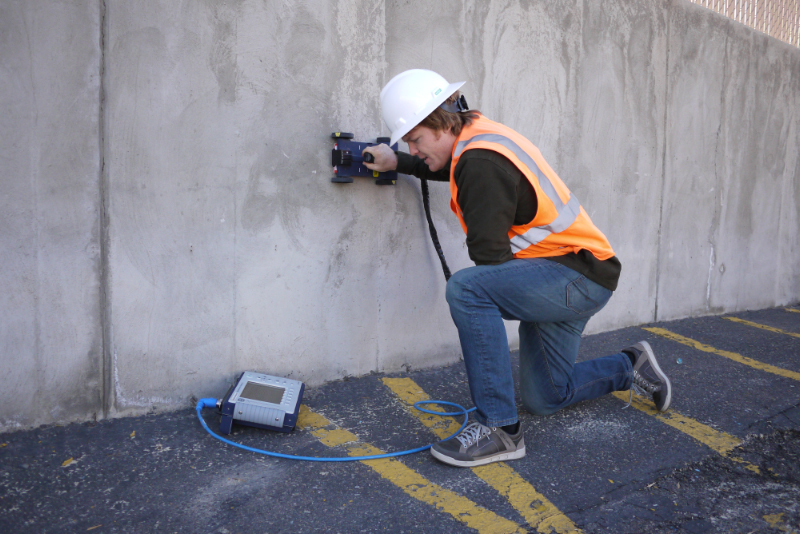 Aaron uses a 1600 MHz GPR antenna to scan a concrete retaining wall for rebar location. Ground Penetrating Radar is very useful for determining concrete integrity, utility and rebar location, and void detection beneath foundations or slabs. Fault structures, slip zones, seepage zones, cavities, and washouts are also found within dams using geophysical techniques such as GPR, resistivity, or seismic refraction surveys. Equipment for GPR consists of two antennae (one to transmit and one to receive) contained in a single unit, a handheld data logger, and an instrument for measuring distance. The antennae are in contact with the ground and are typically pulled along the surface as measurements are taken. Depth of exploration varies from 3 to 50 feet depending on the type of subsurface and frequency of the antenna. GPR works similarly to regular radar; however, the pulses of radio waves are transmitted into the subsurface rather than air. As the radio waves travel into the subsurface they are reflected and refracted by velocity contrasts within the soil or from buried objects. GPR profile shown by the convex-up reflection of an abandoned storm water sewer drain southwest of Helena, MT. Haul trucks transport high grade ore to the mill at Golden Sunlight Mine, Whitehall, MT. High-grade gold ore near Mike Horse Mine east of Lincoln, MT. There are various geophysical solutions for mapping minerals. Airborne geophysics provides the most effective way of surveying a large area while ground geophysics can provide additional detail. Magnetometers are useful in finding minerals due to magnetic anomalies associated with them. Highly magnetic minerals such as magnetite, pyrrhotite, and ilmenite are often associated with mineralizations of interest. Electromagnetic (EM) geophysics is useful in detecting minerals such as a conductive sulfide within an area of more resistive rocks. Time-domain EM, frequency-domain EM, magnetotelluric, and resistivity surveys are among services provided at Geolex. Open pit at Golden Sunlight Mine, Whitehall, MT.